Adding Users are an important step in getting started using Church Metrics. Once your users have been added, they can begin to enter data into Church Metrics using their mobile device or the Church Metrics website. From the Profile drop down, select "Admin"
From the Admin Navigation, select "Users"
1. Name- will be the name that is shown system wide to indicate who the user is. 2. Email- will be used for login purposes and for setting up a password. This needs to be valid. 3. Time Zone- is used to determine how their data is imported in relation to the church. 4. Campus- will indicate what campus information a user can see and contribute to. If you have not created a campus yet, you will want to do so. If you need help you can see our "Creating a Campus" documentation. 5. Role- will determine what level of access a user will have to Church Metrics. These are customizable if you would like to setup roles unique to your campus. By default we have created 3 for you to use. "Admin" gives full access to the site, it allows a user to make changes for all campuses and times. "Staff" is an intermediate role. Users with Staff roles are able to see the "Dashboard", "Reports", "Charts" and "Input" tabs however they do not have access to "Church Settings". They are also limited to only see and input data for their campus. "Volunteer" is the most limited and will only allow a user to input data for their campus. Also, the data must be entered within 24 hours of the service time. 6. 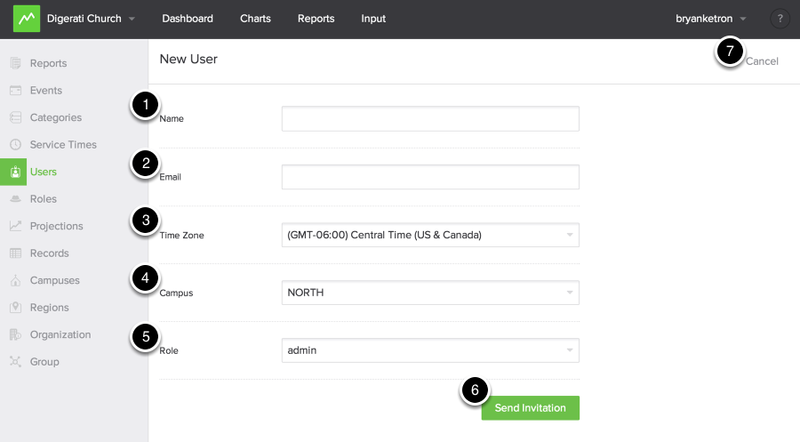 Send Invitation- Once you have setup your users, you can send their invitation. They will be emailed and prompted to setup their password. 7. If you need to cancel your invitation, you can select the cancel button. If you would like to edit or delete your service time at any point, you can go back into the "Users" tab and update them.